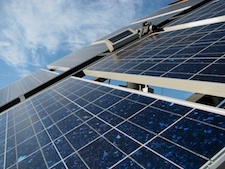 Report from the Field: Japan's Rising Solar - At What Cost? Report from the Field: Japan’s Rising Solar – At What Cost? AEON Lake Town Center fashions itself as Japan`s largest mall and one of the largest in Asia. It also may well be the most energy efficient palace to shopping anywhere in the world. It opened two years ago on the sprawling plains outside of Tokyo, about a half hour drive from the center of city in off-peak traffic periods. The place is gleaming. Fitting its image, one smacks into a Prius dealership walking in one of the main entry ways. A soaring ovoid structure nestled next to the building is topped with photo-voltaics, as are some high awning-like projections from the main building. A spokesman for Kyocera, which made the PV planted on the facility, said that in March 2009, the PV generated 41.8 megawatt hours of power, and during the preceding six-month winter period, it cranked out 186 megawatt hours. The group of visiting American utility executives were duly impressed. But when one member of the group, assembled by the Solar Electric Power Association, asked about the relative cost of the power and the business practicality of the investment, the Kyocera guy and a number of Japanese officials could not come up with a clear answer. Which was an answer in itself. Particularly coming one day after the group’s visit to Ota City, where aided with generous government support a neighborhood of 553 homes were outfitted with solar panels, free to the residents involved in an experiment. The object of the effort that lasted from 2002 to2008 was to study in detail the technical issues that are created when a small area densely equipped with PV is integrated into a larger power grid. All the homes, with a capcity of 2,200 kilowatts, were connected to a single distribution line. “We assume this is the prototype of the smart grid,” one executive said. Japan’s government is investing what it can, but the sum is diminished as it like other governments in the world deals with a debilitating long-term economic slide. Private sector outfits like the owners of the AEON mall are stepping into the breach. So as a society, Japan has its shoulder to the wheel trying to figure out where the next big break through will come cutting solar costs and solving the many technological challenges of integrating it into the power system. But as I walked through the venerable Tsukiji Fish Market in the pre-dawn hours this morning in a jet-lag lingering fog, I couldn’t help but reflect on the fact that this is a merchant nation. Every last person working the fish market knows the value of each fish down to the smallest prawn. When will they apply that fine-tuned sense of commercial value to the whale of an enterprise waiting to be born worldwide – and help solar reach its full potential?